Robert Marion La Follette was an important U.S. political leader during the first part of the twentieth century. He served as governor of and senator from Wisconsin, and was at the fore-front of the political reform movement that has been labeled Progressivism. La Follette was born in Primrose, Wisconsin, on June 14, 1855. He graduated from the University of Wisconsin at Madison in 1879 and then studied law without going to law school. He was admitted to the Wisconsin bar in 1880 and began a legal practice in Madison. He was district attorney for Dane County, Wisconsin, from 1880 to 1884. In 1885 he was elected as a Republican representative to the U.S. Congress. He served three terms and then was defeated in 1890. Following his loss La Follette resumed his law practice in Madison. During the 1890s he became a vocal opponent of state leadership of the Republican Party. He rejected its conservatism and its reluctance to allow government a role in correcting social, political, and economic problems that had grown larger during the last two decades of the nineteenth century. La Follette's reform desires were part of the national Progressive movement. Though not a unified political philosophy, Progressivism was built on the assumption that all levels of government must play an active role in reform. Progressives like La Follette argued that corporate capitalism had given too much power to large economic elites and had created inequities in the social and economic order. In addition, Progressives argued, the political parties, especially at the state and local level, had too much control and were stifling democratic change. La Follette's ideas proved popular in Wisconsin. He was elected governor in 1900 and immediately began implementing his Progressive agenda. The Wisconsin Legislature passed many of his measures, including those mandating the nomination of candidates by direct vote in primary elections, the equalization of taxes, and the regulation of railroad rates. He returned to the national political arena, serving as U.S. senator from 1906 to 1925. He became a leader of the Progressive wing of the Republican party and frequently voiced opposition to the conservative party leadership. As a senator he advocated tougher regulation of railroads, going so far as to call for public ownership of the rail industry. He believed in progressive income taxes, government control of banking, and conservation of natural resources. La Follette was an isolationist, holding that the United States should not become entangled in foreign alliances and foreign wars. He voted against the U.S. entry into World War I and later opposed President Woodrow Wilson's plan to have the United States join the League of Nations and the World Court. The conservative Republican administrations of warren g. harding and Calvin Coolidge proved too much for La Follette. In 1924, after the Republican National Convention rejected his platform proposals, La Follette left the party. He formed the League for Progressive Political Action, commonly known as the Progressive Party, and accepted its presidential nomination. Drawing support from farm groups, labor unions, and the Socialist party, La Follette waged a spirited third-party campaign. He earned almost 5 million popular votes. But La Follette was not a serious threat to the election of Coolidge; he received only thirteen electoral votes, carrying only his home state of Wisconsin. "Neither the clamor of the mob nor the voice of power will ever turn me by the breadth of a hair from the course I make out for myself." Following his defeat La Follette continued as U.S. senator. He died in Washington, D.C., on June 18, 1925. 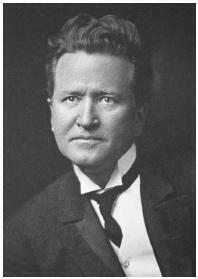 His son, Robert M. La Follette, Jr., succeeded him as senator. The younger La Follette kept the Progressive party alive for another twenty years. Unger, Nancy C. 2000. Fighting Bob La Follette: The Righteous Reformer. Chapel Hill: Univ. of North Carolina Press.